"The only way im wearin it for them is if they all commit suicide," he wrote. "I also enjoy the fact that they often give each other aids and die," he said in another comment about gay people. His comments were riddled with anti-gay slurs. It's not that we've never heard this level of hate before (sadly, we have, many times) - it's that suddenly, a person in his position (a school board member, charged with the educational guidance of our country's youth) is NO LONGER ALLOWED to say this out loud. 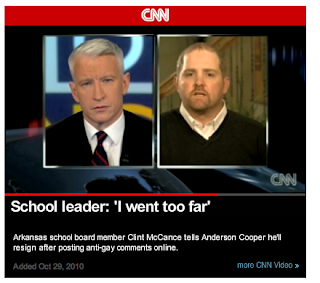 You can watch his interview with Anderson Cooper here. Now I'm not thrilled that Clint McCance and his family have experienced death threats and hate speech directed against them, but I do find it worth noting that our cultural acceptance of this kind of anti-GLBTQ hate speech has ended. And about that, I'm quite pleased. Nobody should celebrate any "other" person's being hounded, bullied, murdered or driven to suicide. Not if that other person is a member of the Gay, Lesbian, Bisexual, Transgender or Questioning community. And not even if that other person is a homophobe like Clint McCance. Having said that, I hope the other homophobes are watching what happened to Clint McCance when he celebrated the death of queer youth. And I hope from now on they watch what they say and post - because they will held accountable for their words, too. And anti-gay hate speech is no longer acceptable. This is one big step towards making things better! And anti-gay hate speech is no longer acceptable." I'm sorry but I just don't feel that's true. It IS still acceptable to a vast number of people. Many condone it silently, voting in politicians who actively seek to legislate hate. I believe a small contingent has become more vocal about how wrong anti-gay hate speech is. But many, many people have absolutely no problem with it. Teachers in the Anoka-Hennepin county school district in Minnesota have been told to remain neutral when harassment between students is based on sexual orientation. Some of those teachers have even engaged in harassment. Sure, there was furor over it but in the end NOTHING WAS DONE. The teacher wasn't fired, no apology was offered. That's one example but I'm willing to bet that hundreds of similar scenarios play out every single day and we're only hearing about the extreme cases. Is it a victory that Clint McCance resigned? Maybe. I guarantee he doesn't feel any differently towards the community now. If anything, he probably hates homosexuals even more now, blaming us for putting him on the spot. He still goes out drinking with his buddies every Friday night, trashing gays and puffing up his chest. That's a victory? Who's to say that whoever replaces him on the school board isn't an equally closed minded bigot, just smart enough not to post their thoughts in a public forum. I would consider this a victory if he'd been fired. If the community and the school board had gotten together immediately and dismissed him, THAT would be an indicator that things have changed. But he resigned. Not because he realized what he did was wrong. But because he and his family were threatened. Things are not changing. I want to believe they are. But they're not. People continue to rant anti-gay slurs (most notably rap musicians). There's a small uproar, sometimes an extremely insincere apology is issued (most often though, it's not; and when it is, who's to say it's heard by the same people who heard the slur? ), and things move on. Damage done. Homosexuality remains the last acceptable prejudice. Our government declares that every day DADT exists (and digs the knife in deeper by polling troops to see how they'd feel about serving with openly gay comrades--can you imagine the hoopla that would have ensued if they'd polled troops to see how they'd feel about serving with black soldiers? With Jewish soldiers? With Muslim soldiers? The reason they DIDN'T poll troops with those questions? The answers would be shocking.) The government condones anti-gay slurs as long as it recognizes marriage as solely the province of a man and a woman. The government says: "You are inferior and unequal." Which is exactly the same as saying it's OK to commit anti-gay speech. For the record, I don't believe he's sorry at all. I think he's only sorry he opened his filthy mouth. Funny how he'd be dancing over these kids' graves while practically begging bullies to go out there and do their pathetic best, but when the tables are turned and he's the one with the bull's eye on his forehead, he's sorry? Oh, please. The fact that he seems baffled over the backlash only shows how stupid he is. What a man. No, wait - what a manly man. There you go. I have such mixed feelings about this. I mistrust forced apologies...they lead to statements like "I went too far." I actually prefer that someone go "too far" in conversation so I can see where they stand, exactly, without camouflage. But then, "too far" can also do some horrible damage. I don't like trying to cure hate with hate. Hate mail and threats? That is such bad form, no matter which side of whatever it comes from. But...I have to admit...despite my misgivings, I do like that people cannot freely spew hate without consequences. Especially in this area, which has seemed to be the last bastion of consequence-free hate-spewing. Hi everyone - thanks for your comments so far. I hear you. And it is infuriating - but the fact that there were consequences for his hate speech does feel new. And I agree, it's not a "victory," but to me it feels like progress. Oh, and I love your point about polling troops - and how they would have never dared ask if the troops would be "comfortable" serving with Blacks, or Jews, or Muslims. Keep your fire and passion, and we'll all keep fighting for equality! I agree- from his interview, it doesn't seem like he actually "gets" that it was his prejudice that was wrong - it sounds like he's just sorry he was caught and there was a backlash. It would be nice to think he'll learn something, though it's quite possible that as Anonymous 6:44am said, this may make him hate gays more since we "cost" him his job... But who knows where his own evolution will take him? Pat, I also found the "too far" comments really disturbing. Like he was critiquing his choice of words rather than the hate that the words sprang from. Like it would have been okay for him to have that hate but just not be so open about it. Ick. But as you said, I'm happy to see that there were consequences for his spewing hate. I agree with anonymous @6:44. Not only is it still acceptable, it is MANDATORY for those who want to keep gays in our place. They know that outside of physical violence--which carries a ton more consequences than hate speech--it's the best tool they have to demoralize the community and let fellow homophobes know where they stand. Don't forget that after the firestorm erupted around McCance, protests occurred in his hometown...including people there to SUPPORT him. Pressure to resign did not come from within. It came from fear. If he and his family hadn't received death threats, I doubt anything would have happened to remove him. I'm not in anyway applauding those death threats; that was reprehensible. But that's the reason he resigned, not because anyone in his community or at the school necessarily thought that what he said was wrong. I'm staggered that a public person would come out with this kind of hate speech and it's right to call him out on it. I just wish we could do that without descending to his level. As you so rightly say, Lee, no one should celebrate another person being driven to suicide, harried or bullied. People publicly supported what he said? That's horrible. I keep thinking, what if he'd said his comments about 5 black teens who had committed suicide. Or 5 Jewish teens. The media firestorm. The backlash. It would have been insane. And all we, the GLBTQ community get, is a resignation. Of course, I want MORE, but I did want to acknowledge the shift I see - though clearly many of you don't see it as being a true sign of change. Most of all, I appreciate your (and the other commenters) passion and engagement in the discussion. Our GLBTQ and Allied Community ROCKS! A similar thing happened only a month ago on my campus. A group of students were putting on a queer film festival, and sent out an email to the women's studies department asking if any of the professors wanted to help. Somehow, an IS professor was on the listerve to receive emails from the women's studies department, and sent a reply saying that he didn't have a problem with gay people, but that we should not "support their compulsions and addictions" and that they are "wounded people who need help." He was not fired, but there was major backlash (the story made the huffington post, actually, yes, this is what we get to be famous for), and the LGBTQ Advisory Board is meeting today to discuss him, as well as other issues. I do consider these types of things to be victories, because it shows how social norms have changed, and continue to change. No, we shouldn't be happy with where we are now, but we are making progress which proves that we can continue to make progress. In many places, hate speech is still acceptable, but the more we spread the message that it isn't, the less likely people are to say things that indoctrinate the next generation with homophobic ways. And Anonymous, right next to Anoka-Hennepin is Roseville, where kids in seventh grade health class are told that it's not okay to say "That's so gay." Granted, I'm not sure if any of them listened, but it's a step in the right direction. I agree that anyone who harassed or threatened violence against this school board member or his family was wrong. I also agree that it's good that people didn't just tolerate his hate speech; that they spoke out against it. And the people who say that this person's mind wasn't changed by what happened, and the minds of the people who applauded him weren't changed, are right. But that's not the point. When the legal rights of women and racial minorities were finally acknowledged in this country, it didn't change the minds of bigots, but it changed behavior and conditions. Therefore, the next generations grew up in a world where people of different races ate side by side in restaurants, used the same facilities, etc. In a world where women voted, and where a woman could hold a job supervising male employees. Before that happened, the bigots said the world would end if it were to occur, but now this state of affairs is casually accepted as normal by many, many more people. Racism and sexism didn't disappear, but they moved farther into the margins, farther from the mainstream. Discrimination against GLBT people is still legal in the US, and it's horrible. But ongoing efforts to raise consciousness and change laws--though they may not change the entrenched prejudices of today's haters--will create a new normal so that there will be fewer haters tomorrow. If that seems too long to wait, I agree that it is too long. Social justice always takes longer than it should. "In many places, hate speech is still acceptable, but the more we spread the message that it isn't, the less likely people are to say things that indoctrinate the next generation with homophobic ways." "ongoing efforts to raise consciousness and change laws--though they may not change the entrenched prejudices of today's haters--will create a new normal so that there will be fewer haters tomorrow." Thank you for stating it so eloquently. And yeah, social justice does always seem to take longer than it should. the first anon poster writes: "Homosexuality remains the last acceptable prejudice." I'm sad to say I don't think that's true - there are a number of "acceptable prejudices" out there, including those against fat people, southerners, and lower-class people (ie, "trailer trash"). I'm sure there are more that I'm forgetting; these are just often in the forefront of my mind. This McCance guy - ugh. I'm very sorry he received threats and hate; he'd be better off having received serious explanations of WHY what he said was so grossly inappropriate. And then maybe some therapy to deal with whatever it is that makes his homophobia SO rage-filled and virulent. I *AM* glad that hue and cry were raised over his remarks. NO ONE should be thinking, feeling or publicly saying such horrifying things, especially not a public servant tasked with overseeing the education of children and teenagers. RE: Lee's comment that social justice, unfortunately, takes a long time in coming reminds me (again, as I am often reminded) of Dr. Martin Luther King Jr's "Letter from Birmingham Jail," which I think may be one of the most inspirational documents in English. When I read the "Letter" now, I usually find myself thinking about the struggle for equal rights and protections for LGBTQ folks.